SAN FRANCISCO--(BUSINESS WIRE)--Today, Wells Fargo Bank, N.A. (NYSE:WFC) announces that customers now have card-free access to all of its 13,000 ATMs(1), coast-to-coast. The company’s One-Time Access Code technology allows customers to authenticate at an ATM using an 8-digit token and their debit or ATM card Personal Identification Number (PIN), instead of a physical card. Customers first log into the Wells Fargo mobile app, select Card-Free ATM access under Account Services, and request a one-time-use, 8-digit access code. 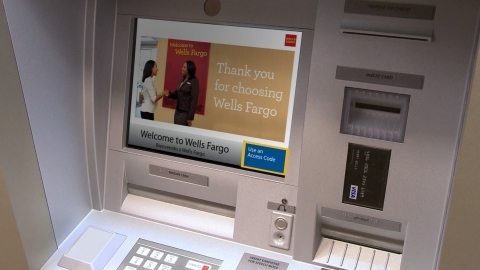 Upon arriving at the ATM, he or she simply enters the code and their debit or ATM card PIN, then proceeds to the main menu to perform their transaction (visit Wells Fargo Stories to see this technology in action). Wells Fargo’s mobile banking is the company’s fastest growing channel, reaching a milestone of more than 20 million active customers in March. Recently, Keynote awarded Wells Fargo first place on its biannual Mobile Banking Scorecard, citing the bank’s leadership in digital functionality, quality and availability, ease of use and mobile app experiences. In addition to One-Time Access Code, later this year customers will be able to initiate a cardless ATM transaction with the “tap and pay” technology in an NFC-enabled smartphone. When this feature is live, a customer will be able to initiate a transaction by signing into a leading mobile wallet (Wells Fargo Wallet, Apple Pay, Android Pay or Samsung Pay), and holding the phone near an NFC-enabled ATM terminal. Once authenticated, the customer will input their debit or ATM card PIN and complete their transaction. More than 40 percent (more than 5,000) of Wells Fargo ATMs are currently NFC-enabled. For more information, visit www.wellsfargo.com. (1) The entire fleet of Wells Fargo ATMs has One-Time Access Code technology; however, some ATMs, located inside select branches, will only feature card-free access during non-business hours when team members are not present to assist customers. Additionally, some ATMs are located within secure locations that may require customers to swipe their cards for entry. Wells Fargo customers can access all of its ATMs with the mobile app, becoming the first large bank in the U.S. to have an entire fleet of cardless ATMs.